Conducted in cooperation with the People’s Republic of China, the Michigan 4-H China Project is a global education program that allows youth to explore another culture while communicating with their peers across the globe through visual letters. Always wanted a pen pal? Why should Michigan youth be involved? To develop awareness, understanding and appreciation of other cultures that will last a lifetime. China is an important country with one-fifth of the world’s population; it is the third largest country in the world. Chinese culture is more than 3,500 years old—the oldest in the world—rich in the arts, science and philosophy. China is home to the fastest-growing economy in the world. 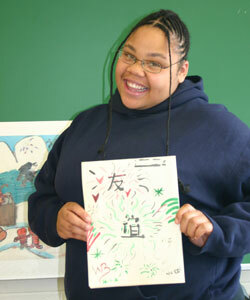 Program participants are invited to send “visual letters” to children their own ages in China. Teaching kits are available to facilitate teaching about China and about making art. Each teaching kit is unique and consists of nine or ten original pictures by Chinese children, a study guide and a description of the pictures that come with the kit. A selection of Michigan artwork is then sent to China as a gift to the children of China. An announcement about the art exchange usually is sent to county MSUExtension offices in the fall. The deadline for submitting artwork to the State 4-H Office is usually early May. The 4-H Children’s Art Exchange kits are available for year-round use. (The study guide and description of the pictures from Kit A are also available in the Resources section below.) Contact your county MSU Extension office to borrow materials. This kit is filled with silk dance costumes, papier-mache masks, rice straw hats, ribbon sticks and music for the Chinese Children’s Ribbon Dance. The materials help young people learn about classical and folk dance in China. This kit has been retired and only available per special request to State program coordinator Jan Brinn brinn@msu.edu. This kit consists of 12 ribbon wands and an audiotape of music and dance instructions. The dances are easy to learn for dancers and non-dancers alike. The ribbon sticks are also fun for children to use to create their own dances. This audiovisual program encourages children to think about the daily lives of children their own ages who live in the People’s Republic of China. Visits to elementary classrooms, playgrounds and after-school art activities are included. The program is about 6 minutes long. A discussion guide for grades K-4 is included. The Turkmenistan youth have sent artwork to Michigan's Branch County as a start to the exchange initiated in 2018. Michigan 4-H received a special gift from China in celebration of their 25 years of partnership with the Michigan 4-H China Art Exchange. Participants learned about visual arts, crafts, sewing and textile projects at the 2017 Michigan 4-H Creative Arts Celebration Workshop. Dollar Street is a wonderful resource for young people to explore the world without ever having to leave their own home.